Repairing the concrete in an airport is important because public safety depends on it. When cracks appear and the concrete becomes unlevel, it is time to contact the professionals of Polyjacking.com. We have the concrete solutions and equipment to get the concrete back to its original level and safe again. Concrete can sink and shift due to the soil conditions beneath it. When soil becomes overly wet it heaves and when it is dry, it shrinks. This causes concrete to also shift and shrink, causing it to become unlevel and crack. Whatever the concrete problem is with the airport's concrete, Polyjacking.com has the solutions for you. 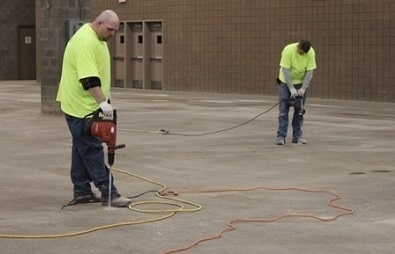 Polyjacking is the method we use for concrete leveling in airports in St. Louis and Kansas City. This is a high-density polyurethane foam that is injected through a 5/8" hole that is drilled into the affected concrete. This foam expands to completely fill the voids beneath the concrete. It has a short hardening time so the concrete surface is immediately ready for use, unlike the mudjacking process. It is also a dense material that is impervious to water preventing any future erosion problems. Moisture resistant - The specially formulated polyurethane material is designed for wet conditions. If the airport in your area is in need of concrete repair, contact the experts at Polyjacking.com.